We got lucky with the weather, as you can see from the photo taken at the pass, the place where we were most likely to encounter snow and ice. It was just wet. Billy went along for fittings, and I finished his new sweater during the trip home. Here it is after blocking. It's made to go over the doll's head. 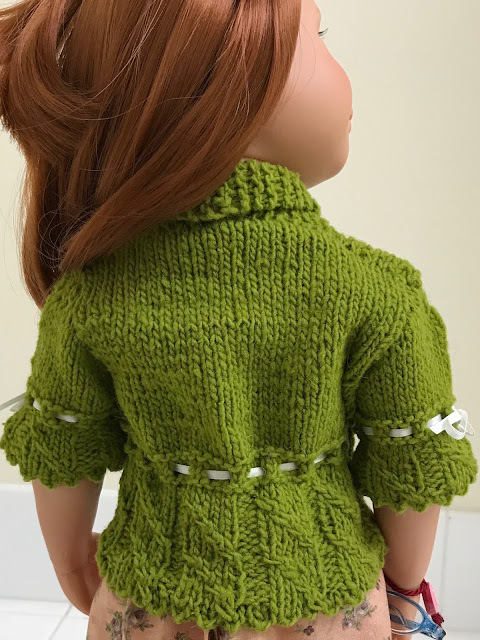 Usually doll sweaters open completely down the back. This style of sweater has a large opening at the neck, so the back neck can be closed. The back still has an opening below the neck to facilitate getting the arms into the sleeves, though. This works well. 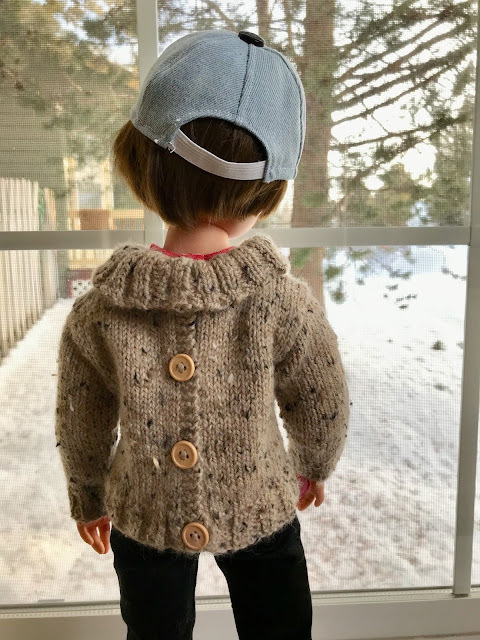 The pattern is Jacqueline Gibb's 42 Shawl Neck Sweater and Cap. I knit it as-written, except that I went down a needle size to get a slimmer fit, worked the sleeves in the round rather than flat and worked 8 extra rounds for the sleeves. 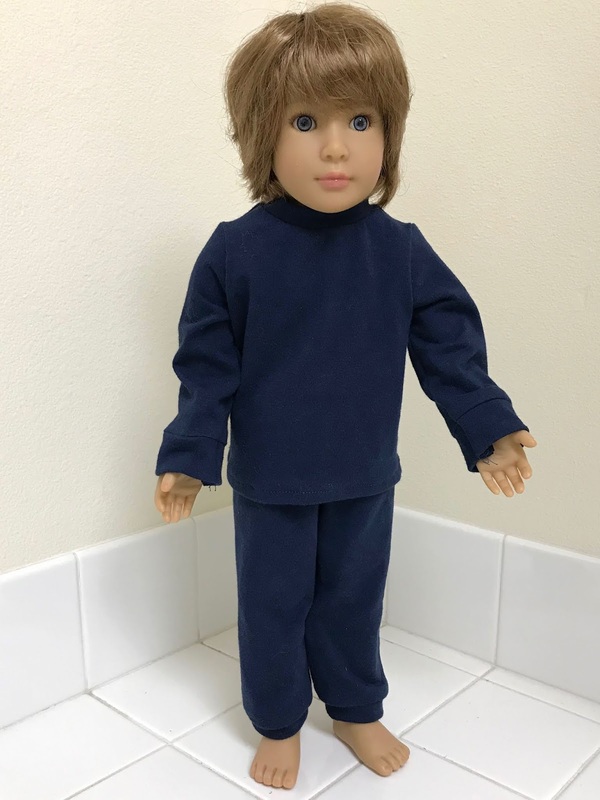 It's still big in the back, having been designed originally for American Girl dolls, who clearly haven't heard about Paleo or Keto...or even portion size. 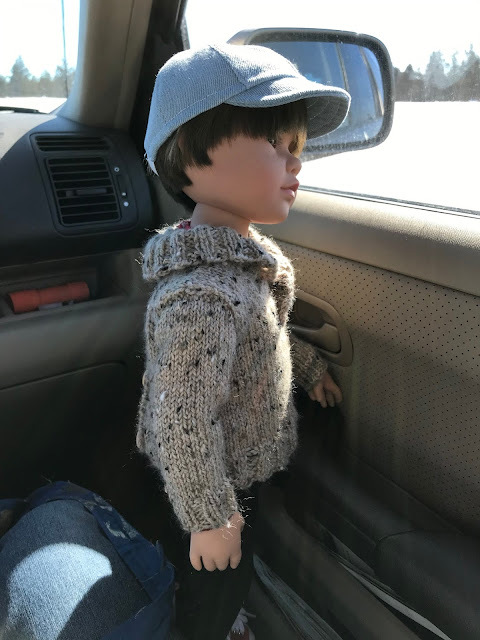 At any rate, I have found that fronts of patterns for American Girl dolls often fit fairly well, but the backs of pants, shirts and sweaters are too big. I went on from there to make a cardigan for Mandy, who hasn't had anything new knitted for her for nearly a year unless she knitted it herself, which means she hasn't had anything new knitted for her. (Mandy is my knitter, but her knitting is just imaginary, so she needs some help.) This pattern was the Lavernia by Deb Denair. Again, I went down a needle size to get a slimmer fit. This one was also a bit big in the back, but the ribbon sash brings it in, so the fit isn't too bad. I worked the pattern as-written except for knitting the sleeves in-the-round and grafting the shoulders and collar instead of seaming them. I didn't add anything to the length of the sleeves, as I could see that they would still cover the elbow joint. I also didn't add to the waist length, so the waist falls above the natural waistline (if a vinyl body can be said to have a natural waistline), which I find flattering. The only thing I would do differently on this pattern is NOT to use the same yarn. It's Retrosaria João. 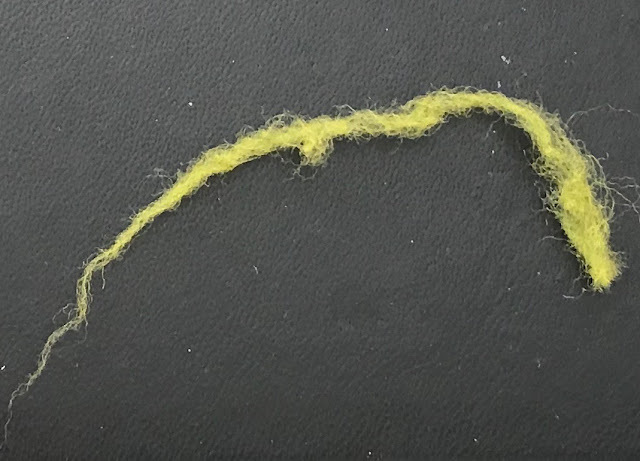 The yarn is a lovely color that reminds me of a variety of lichen, and I like the varying thickness, but it broke easily and even came apart in my hands when I came to places in the yarn that were not sufficiently spun for the thinness of the yarn. This scrap that came off will give you an idea. You can see right through the yarn. Finishing the cardigan required a lot of weaving in of loose ends where I had to join the yarn because of breakage. I think the project will stay together, though, because the knitting is tight enough, and it has been thoroughly blocked. The pattern was a delight to work with. I was warned of errata on the designer's project page, which I wrote in on my pattern. Alister will be going to live with Zachary next month, so I'm trying to get him outfitted. I tried Billy's PJs on him. They seem to fit OK except for the sleeves, which are too long. That was not what I expected, because Alister's shoulders are bigger than Billy's, and I thought the extra length would be taken up by the shoulders. I can use the same pattern, though. 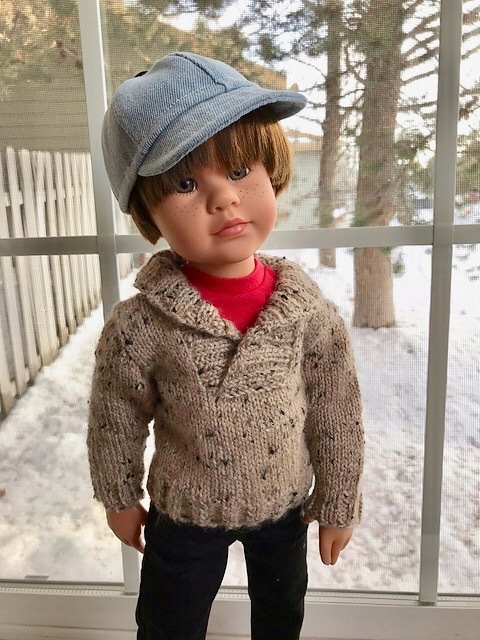 Alister, a Kidz n Cats doll, came with some very nice clothes, including hiking boots, and a jacket and hat, so he mostly just needs a sweater, spare pants and an extra shirt or two, along with a change of shoes. He also has a stuffed toy cat. He's fully jointed, making posing difficult for small children, but Zachary is old enough now that he should have no problem. This particular Alister is a survivor of Hurricane Harvey. I've been fostering him while waiting for his new dad to get a little older. Kidz n Cats dolls are no longer being produced, and Alister may be sold out worldwide. We had some excitement Wednesday morning. The dogs alerted us to some unusual activity out in front of our house. Apparently a neighbor slipped on the ice and injured his ankle. 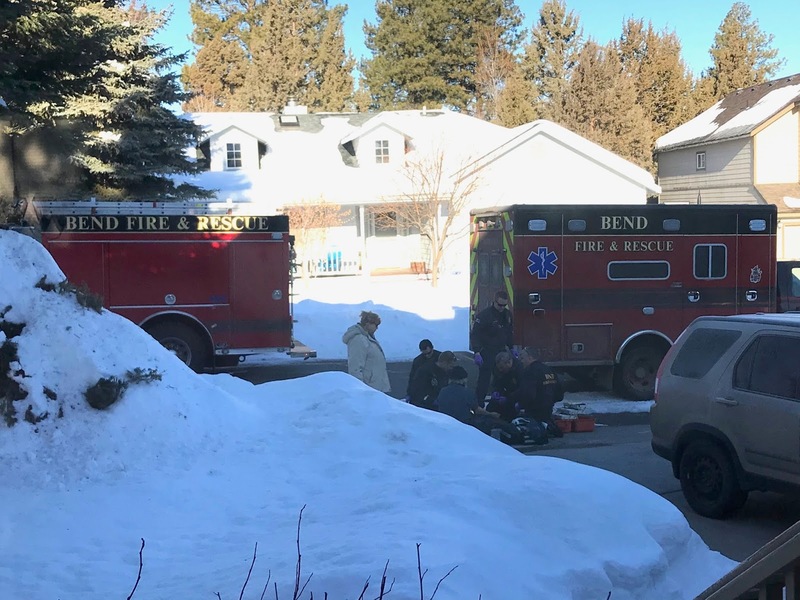 Bend Fire and Rescue came to the...um...rescue. Ice is a problem, because we've had warmer days lately, so the snow melts, but then it gets cold at night, so the water freezes. The spot where he fell is right where the sidewalk slopes down to the driveway. We had trimmed that fir tree to the left in the photo, because its branches were blocking the sidewalk. 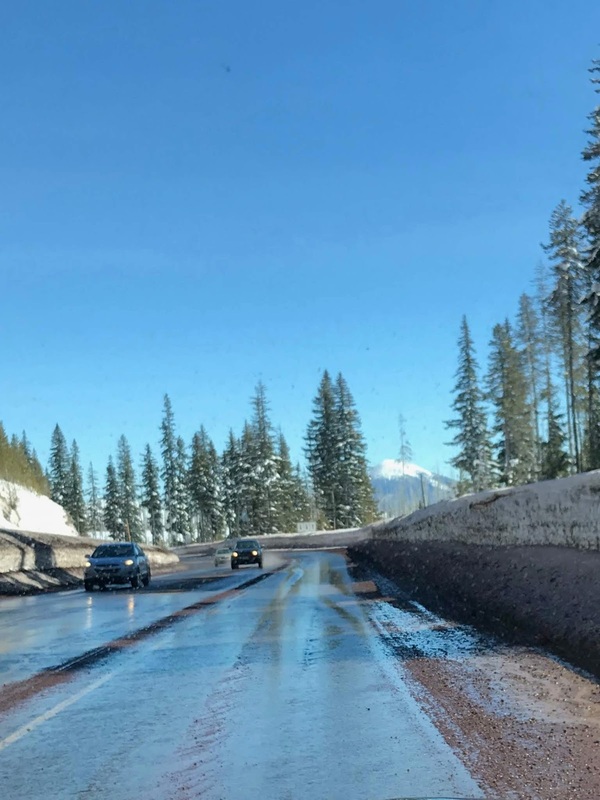 We have now treated this area with snow-melt salt. We're hoping that it will keep the sidewalk free from ice. 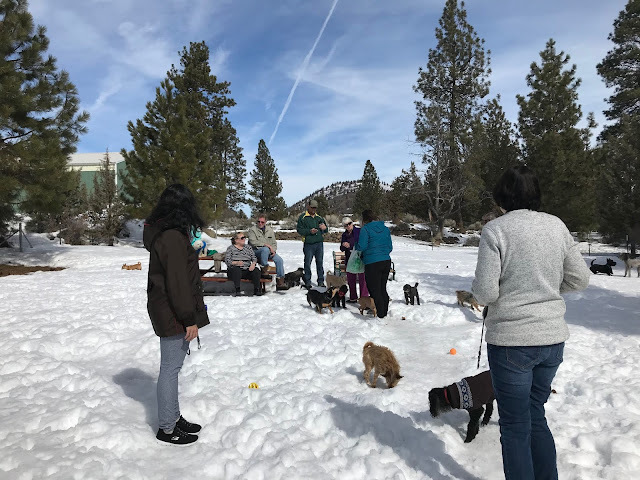 The snow is starting to melt at the dog park. Nice weather brought out the crowds. You can see Rocky in the foreground in front of the lady with the grey sweater on. (He's also wearing a sweater.) Dusty is at the far right, playing with a scottie dog. I will have to go back today, because the dogs get groomed at lunchtime, and they are happier if they have had some playtime first. I usually try to keep them clean for a few days after grooming anyway. I made naan in the bread machine to have with some Indian dal stew. 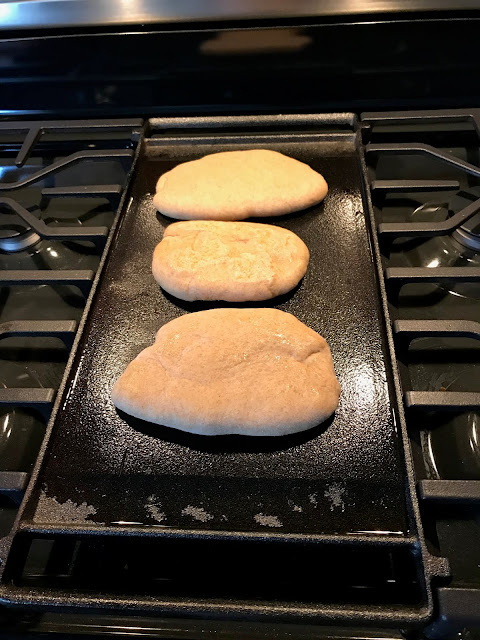 This was the first time we had used the griddle that fits over an oval burner in the middle of our stovetop. It worked out very well. The Irish soda bread I made yesterday was a greater challenge. I had to use baking powder instead of soda, and the recipe I used didn't have enough liquid. What's on my needles: Finished Billy's sweater, then made one for Mandy. Still working on the Coastal Skies Shawl with a few more rows done. I hope to finish the Kisu Takki cardigan this week. What's on my sewing machine: Clothes for Alister, repairs to family clothes. What's in my hoop: Still the Spring Flowers quilt. I hope to get back to it soon. 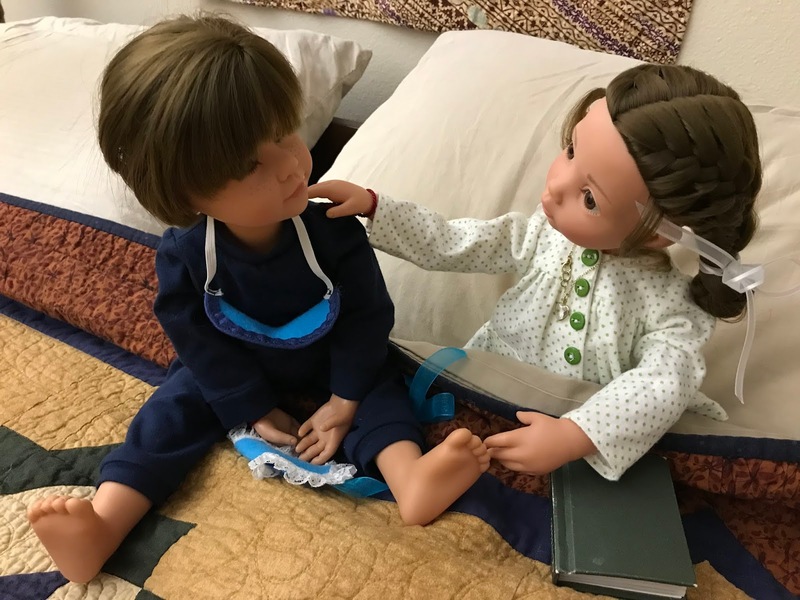 What's in The Doll's Storybook: What Dreams May Come. Billy has a nightmare and seeks answers from Veronika. What's on my iPad/iPhone: Finished Music in the Hills by D. E. Stevenson. It's the third in the Drumberley series. If you want to read the series in order, start with Vittoria Cottage, then Winter and Rough Weather. I read them out of order, but I had read them before, and the surprise is not so much about what but about how anyway. Now listening to her The Four Graces. Stevenson's novels are like visiting mid-20th-Century England and/or Scotland and staying with colorful, natural characters for a nice visit with lots of tea and toast. What's in my wine glass: Farmhouse Red Blend from David Hill Winery in Forest Grove, Oregon. What's my tip of the week: Most bread machine manufacturers recommend not leaving water in the pan too long for cleaning and not immersing it for long. It wears out the silicone seal. I've found that letting it dry out completely makes it easy to just wipe the remnants of dough out, and you can scrape any dried dough off the shaft with your fingernail. However, if you do ruin the seal, causing the pan to leak, it can be replaced like this. We're supposed to get more snow, too. Hi Peggy as usual I enjoyed your blog. I loved the doll sweaters. I don't knit or crochet so I admire those who do. It is starting to feel like Spring here in Maine but more snow is predicted for the weekend. But this time of year it don't last long. Thanks, Janet! Our snow is going fast. The little cherub statue in the backyard was entirely covered by snow on Sunday, and now you can see his whole body. I enjoyed reading your blog as usual Peggy. I sure hope the neighbor wasn't too badly hurt by his fall. Our snow & ice is finally gone here in MId-Missouri. For a while I was beginning to think we had entered another ice age! 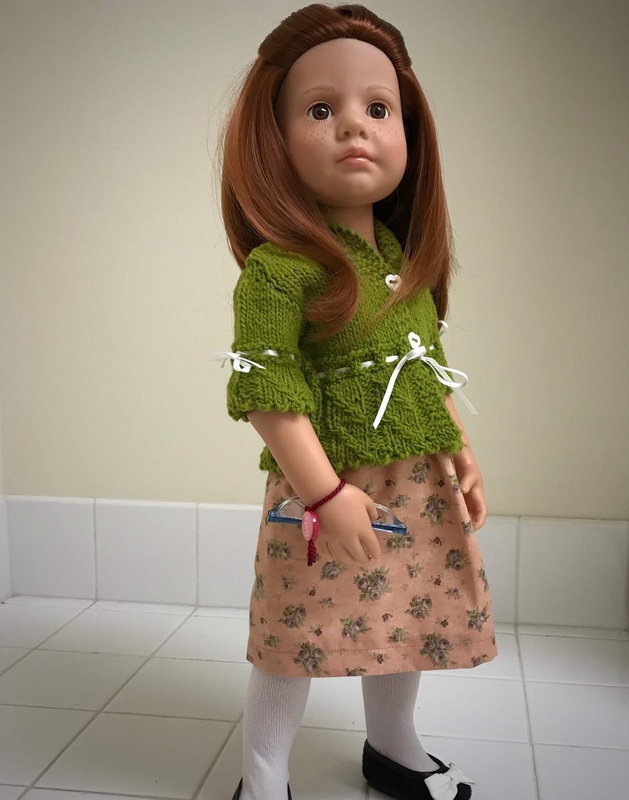 Love the dolls' new clothes especially the green sweater. Too bad the yarn gave you such problems.